Destination weddings are becoming increasingly popular, they’re a way for couples to get married in a location that has meaning or in a place they’ve always dreamed of going together. It’s also a way to have a small intimate wedding with family and few friends. If you’re considering making your wedding a destination, here are some tips to help you plan and get the best possible deal for you and your guests. Plan your wedding for a weekday during an off peek time of your destination. This means doing some research into your location. For example if you choose to get married in Rome, Italy, the city has a limited off season which means that you’re probably less likely to get a deal in Rome than somewhere else. So check and see which months are the slow period for your destination. At a destination wedding you can plan special group outings, spa treatments, tours and dinners out. If you have a small group it’s possible to ask for deal packages in order to make it more affordable for your guests. 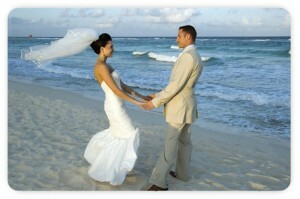 You could even hire a wedding planner who specializes in destination weddings. If you book your wedding at an all inclusive resort the room, food and fun should be covered by one payment. so you can block off a bunch of rooms for a special rate. Also let guests know in the invitation if they’ll need a valid passport. You might even want to consider getting married on a cruise. When considering your destination keep in mind the time of year, if you choose a Caribbean destination make sure that you’re not planning your wedding during hurricane season. You can even work with travel agents to ensure that flights, hotels and entertainment come in a fair-priced package. In order to better enable your guests to save money for your big day, give them and yourself plenty of time before the date. Send out wedding invitations 10-12 months in advance. If you plan to pay for a portion of your guests air line tickets, or hotel costs, be sure that you can afford to do so, and that you have time to save the money you’ll need to do it. So if you choose to make your wedding a destination, keep these tips in mind when planning so you and your guests can have the time of your life, without decimating your purse strings.